100 days of school already? How can it be! While the exact day may be a few weeks away, planning for the celebrations now will help you avoid the last minute rush for activities. Check out the fun lessons ideas below from classroom teachers who really know how to make the 100th day of school a special one! Anytime is a Fine Time to Learn about 100! This idea comes from Tracy, a 1st Grade Teacher in Dyersburg, Tennessee. She says, “In order to help kids focus during transitions and at dismissal time, we use the time to review skills and concepts. For example, as my students line up to depart for the day, I may ask them to take turns spelling a word, define a vocabulary word, or answer a science question. As the 100th day of school approaches, I center my questions on that theme. I may ask students to name characters from 100th Day books we’ve read, or ask them to skip count by 10s to 100, or ask them to each contribute an item to an ongoing chart list of 100 we are creating (e.g., 100 Tasty Treats, 100 Favorite Books, 100 Animals We Love, etc.). Create a bond between younger and older students with this activity by Tara, a 5th Grade Teacher from Salisbury, North Carolina. “With this 100th Day of School project, we had my older students pair up with younger students in another class to create a collection of 100th Day of School Math Board games. To begin this project, I asked my older students to bring in samples of board games they enjoyed when they were young. We examined these to see how they were played, the aim, rules and challenges of each game, as well as the game pieces needed to play. I guided my students to notice that some games were games of pure chance, while others involved some skill or strategy. I offered my older students a list of supplies (file folders, cardboard, construction paper, tape, glue, markers, stickers, die, etc.) that I would provide when it was time to make the games. On the list, I included an invitation for them to bring in any supplies from home they might like to use as well. For homework, I asked children to take the supply list home along with a page of directions that outlined the assignment and included the criteria for game development (e.g., it must be a board game young children can play; it must be able to be played in one sitting; it has to be for 2 or more players, etc.). On the directions, I reminded students to K.I.S.S. : Keep it simple, kids! Along with the criteria, I gave them a choice of early elementary math topics to consider, such as number recognition, one-digit addition, counting, money, etc. I reminded my students that their games also had to relate to the theme of 100th Day. After my students had conceptualized their games (with the help of their parents, if they wished) they had to write clear directions to each game. (Easier said than done!) After that, I had them meet with the younger students so the little ones could learn about the game ideas and help with the game construction and production. 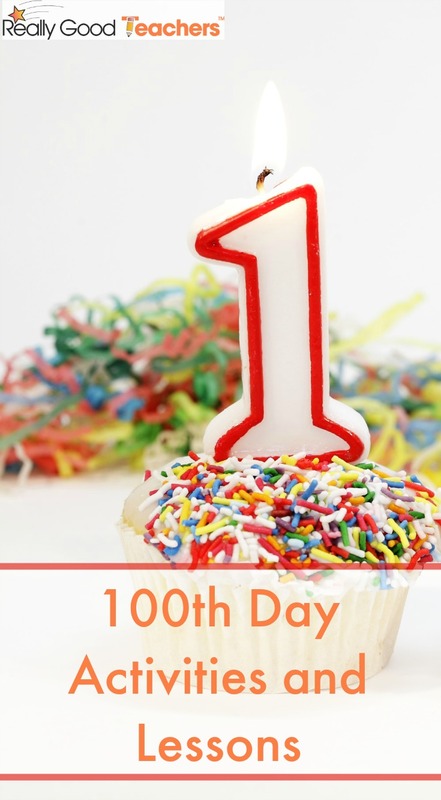 What is your favorite way to celebrate the 100th Day of school? Shop Really Good Stuff for all of your 100th Day teaching supplies! The Math Game Boards sound like an awesome idea! I hope I can find another teacher in my school that would like to do this with me! On the 100th day of school I have my students wear a collection of 100 things. Students have worn shirts with 100 sight words, 100 pop bottle lids, 100 titles of books, etc… We also wear the Really Good Stuff 100 glasses. By the way you should create a 50’s glasses because we also celebrate the 50th day of school. Of course we do math activities using the number 100 like flipping a penny 100 times and counting how times it lands on heads and tails. Estimation is really hard for my students. We have 2 estimation jars that circulate through the class for them each get a turn and put items inside so we can estimate, then count. For our 100th day celebration, we have special snacks (who doesn’t love to eat), sing, write, and review counting activities that all involve the wonderful 100! I make a special 100 cake for the kids to eat. (For the 1 cake I use a rectangle shaped pan and for the 0 I make 2 0’s from a tube cake pan and then decorate.) The kids really enjoy the celebration and enjoy eating the special snacks. The 100th day has become one of my favorite math celebrations! I’ve tried idfferent things from having the kids do 10 sets of 10 different exercises to add up 100, of course skip counting and reading from different books about the 100th day of school. My all time favorite activity though is some M&M math. Wearing gloves I divide the candies from piles of 100 into equal amounts for the classroom the day before the 100th day. (As equal as possible,depending on how many children I have that year.) I try to give each student around 20 candies. The next day I pass out the candies in small ziploc bags and we do a statistics lesson. They divide their candies into seperate piles and then we make bar graphs showing the different colors. They then answer questions about their candies. Of course they get to eat their math projects because they did wash their hands before starting this project. On the 100th Day I like to do an estimation activity with my first graders. I show the students what 100 seconds feels like. Then the student estimate how far they can count, how many jump jacks they can do, how many licks on a lolipop and how many bubbles they can make with their bubble gum all in 100 seconds. Then the students partner up and help each other count the events while I time with a stop watch. My students always love this activity!!!! I love the coin rubbing idea. Kids definitely enjoy being around money, so this is a great idea to get them interested in academics!